MOTU’s MachFive is an oft-overlooked software sampler option for both Mac and Windows. 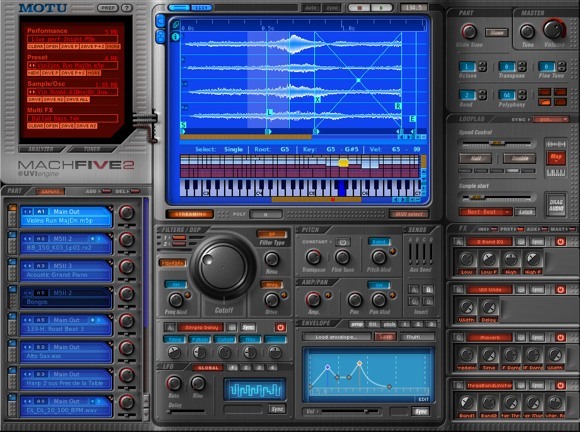 The sampler market is a crowded one, but MachFive does have some nice features, not least being a unique, one-screen interface. The sampler hasn’t quite kept pace with recent releases from Native Instruments, Cakewalk, and others, so this week’s release of version 2 is a welcome development. Loop Lab: Edit and create loops in REX, ACID, GarageBand loops via drag and drop, with destructive and non-destructive editing down to the sample level. Multi-platform: Now fully supports Universal Binary, Vista, and even 64-bit Vista. More compatible: A huge array of sample formats load natively — no conversion required. Tons of effects: Distortion, convolution reverb, and dozens of others. Layers: “Layer rules” allow you to stack or organize sounds for performance/playing, and even import layers from GigaStudio. New sound features: New integrated sound design features include multi-point envelopes and streamlined editing. Integrated synthesis: This appears to translate to integrated synth sources, including basic waveforms and an additive organ emulator. Thanks to John Molloy for the tip! Updated: Upgrades are actually free if you bought MachFive after January 20, 2005. (No, that’s not a misprint. They really are going back two and a half years.) US$195 otherwise.